Details: One of Donovan’s chicks. Our initial assessment was that this is a female, but weight and other morphology are borderline, so for now we will call it Juliet, but perhaps it will morph into a Julien. (s)he is sister/brother of Tilton (2014), Chip (2012), and Jill (2012). Access to the nest was generously provided by Donovan Tree Experts. Details: One of Art’s chicks. Sister of Bridget (2014), Artoo (2013), and Bergen (2013). Details: Breeding male at Ayers Island Dam on the Pemigewasset River. Huge thanks to Dallas Wrath of Donovan Tree Experts for providing bucket truck to get to nest. 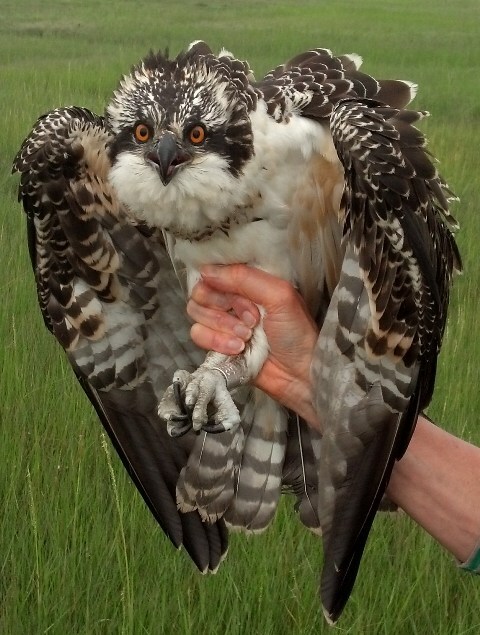 Gundersen is named after long-time PSNH employee Bob Gundersen who was a passionate steward of the Ayers Island Ospreys for many years until his retirement. Gundersen's mate has been at this nest for several years and is the mother of Saco and Pemi (hatched in 2011). We don't think Gundersen was the breeding male here in 2011 as there were a couple of "rocky" years with several males fighting over this nest. Gundersen's nearest neighbor to the south is Donovan's nest in Tilton and his nearest neighbor to the north is Art's nest in Bridgewater. Details: Wausau is the breeding male at a long-established nest on a huge 60ft pole in Groveton. The pole is close to where the Upper Ammonoosuc River meets the Connecticut River, close to the Vermont border. This is the immediate nest neighbor of Mackenzie (a male we followed in 2013). Huge thanks to Tim Bergquist of Chippers Tree Service for providing the big bucket truck to reach this high nest. We tried here two years ago, but the truck we had that day wasn't high enough. Wausau is named after the huge paper mill which used to own the land on which the nest is located. The original nest here was on an electric pole. The nest caught fire one morning and took out power in the town for several hours. A pole was installed nearby with a nest platform to persuade this pair to move there. Ospreys have nested successfully here for many years. Details: Staddler is the breeding male at a nest on a 10 foot high platform in the saltmarsh at Seabrook Harbor. 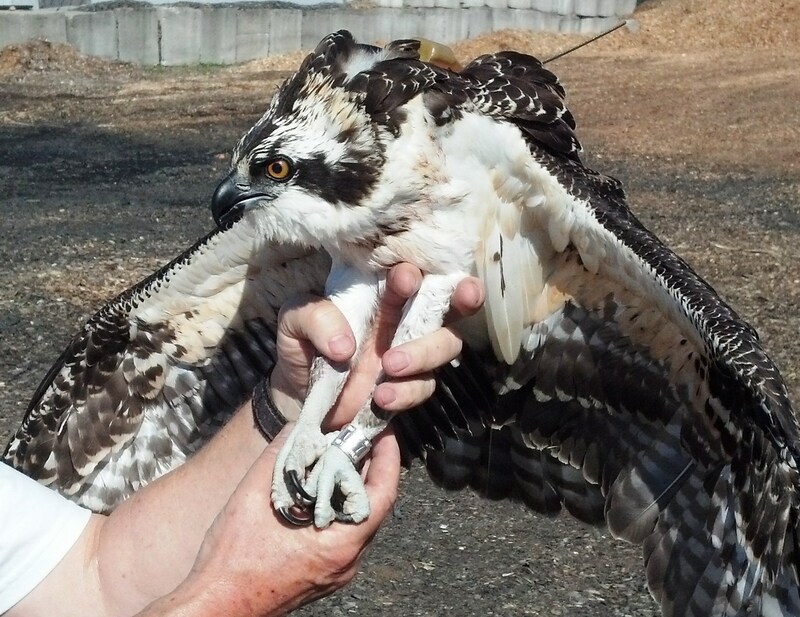 Ospreys originally nested on top of a duck blind before local resident Dave Weber installed a platform several years ago. We tagged Weber in 2013 at a neighboring nest. A huge thank you to Dave Weber for providing boat access to these nests. Staddler is named after the short wooden stakes which dot the saltmarshes of New England. These Staddles were used to hold platforms where harvested saltmarsh grass was stacked to dry. The weather-worn stakes still persist today and now provide perfect feeding perches for Ospreys. Details: Tilton is one of two chicks raised by Donovan and his mate at their nest in Tilton. He is a brother of Jill and Chip (tagged here in 2012). He was caught with a noose carpet on the nest three weeks after fledging. Details: Bridget is one of three chicks raised by Art and his mate at their nest in Bridgewater, NH. She is a sister of Artoo and Bergen (tagged here in 2013). She was caught with a noose carpet on the nest three weeks after fledging. Details: Artoo is one of three chicks raised by Art and his mate at their nest in Bridgewater, NH. He is brother of Bergen. He was caught with a noose carpet on the nest three weeks after fledging. His dad and brother were caught simultaneously. He received the transmitter that had been worn by Art since May 2012. Details: Bergen is one of three chicks raised by Art and his mate at their nest in Bridgewater, NH. He is brother of Artoo. He was caught with a noose carpet on the nest three weeks after fledging. His dad and brother were caught simultaneously. He is named after the grandson of Science Center Board member Liz Hager. Bergen got to view the catching and tagging process. Details: Weber is one of we believe two chicks fledged from a low platform in the saltmarsh in Hampton Harbor. The platform was installed by local sportsman and outdoorsman Dave Weber. Dave kindly provided his boat and expert knowledge of the saltmarshes to get us in and out safely. We caught Weber and her mom at the same time using a noose carpet trap. We were joined in the marsh by Sharon and Scott Harvell who were the winning auction bidders on a once in a lifetime chance to join the tagging team. Details: Father of Chip and Jill. His nest is located on the grounds of J. Jill's New Hampshire distribution center in Tilton. Donovan and his mate (we caught and banded her in 2012) were incubating three eggs. Donovan is named in recognition of Donovan Tree Experts of Meredith, NH who very kindly provided the bucket truck and skilled operator needed to access the nest. J. Dallas Wrath, owner, skillfully raised Rob Bierregaard to the nest to install the trap. Donovan was caught within three minutes of placing the trap and his mate was back incubating the eggs three minutes after the trap was removed. Details: Mackenzie is named for Mackenzie Wrath, daughter of Dallas Wrath, owner of Donovan Tree Experts who provided the bucket truck and skilled operator needed to access the nest. Mackenzie got to release her namesake. He and his mate were incubating three eggs. Their nest is located on a pole that was installed several years ago by Public Service of New Hampshire in partnership with NH Audubon and NH Fish & Game Department. Details: Sister of Chip. Both chicks – of a brood of three -- caught post-fledging using noose trap in nest. Jill was named in recognition of J.Jill, the women’s apparel company. Jill and Chips nest is located on the grounds of J.Jill’s New Hampshire distribution center in Tilton. 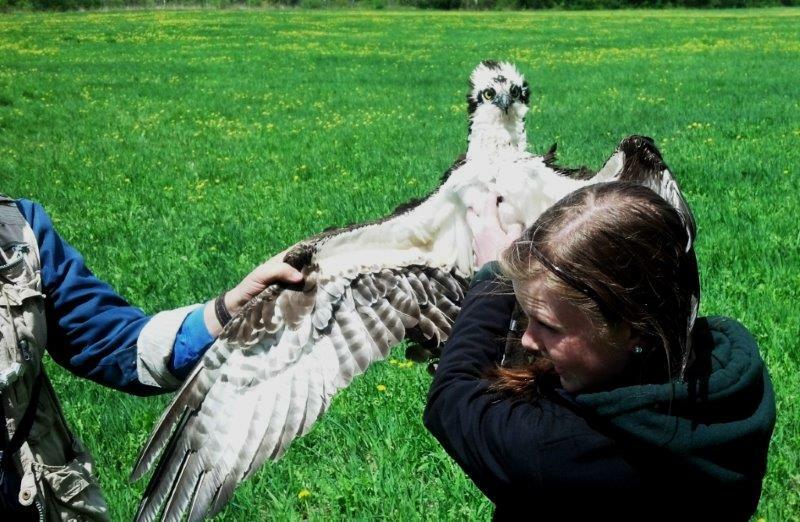 J.Jill very kindly allowed Iain MacLeod to install an artificial nest/platform and pole on their property to provide a safe alternative nest for a pair of Ospreys that had previously tried to nest on a nearby cell tower. Public Service of New Hampshire (PSNH) provided financial support for the installation of the pole/nest. The pole was installed in April 2012 with 3 Phase Line Construction of Farmington, NH. Details: Brother of Jill. Both chicks – of a brood of three -- caught post-fledging using noose trap in nest. 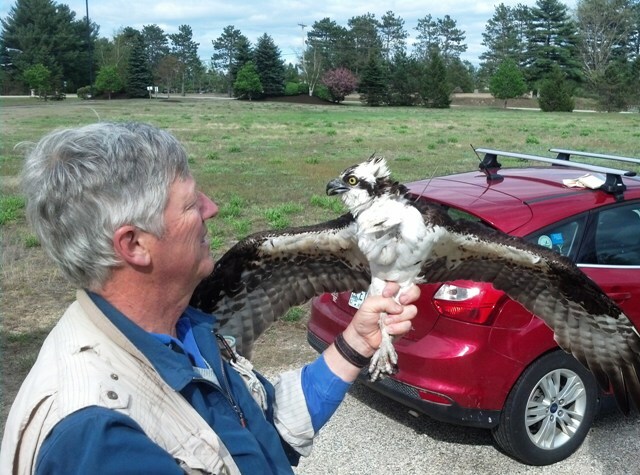 Chip was named in recognition of Chippers Tree Service of Meredith, NH, who provided the bucket truck needed to access the nest. Thanks to Tim Bergquist and Chippers for their invaluable help. Details: Breeding male. He first built this nest on a disused utility pole late in 2007. He raised single chicks in 2008 and 2009, and two chicks in 2010. In 2011 we attempted to catch him in May, but he was having none of it. We did trap his mate (and band her). Their nest was destroyed in a freak windstorm in June just after they hatched one chick. A new platform and nest was installed (bolted firmly to the cross arms of the pole) in June 2011. Both adults returned in 2012 and happily accepted their new nest. We successfully trapped him (with a newly designed nest trap). They were incubating 3 eggs. One chick successfully fledged in 2012. Art successfully migrated to east-central Brazil in 2012 and returned to his nest in April 2013, where he reunited with his regular mate and reared 3 chicks. He was re-trapped on August 12, 2013 and his transmitter removed (after more than 14,000 miles of use). His chicks Bergen and Artoo were tagged on August 12, 2013. Details: One of three chicks in nest. Sister of Pemi.